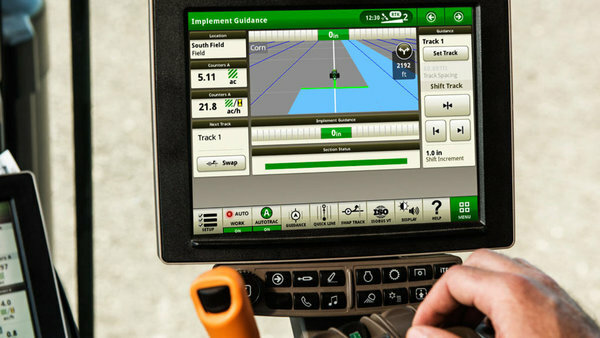 The technology behind John Deere AutoTrac™ is designed to make the user experience as simple as possible. However, any piece of technology needs to be properly set up and sometimes troubleshot when problems arise. These videos will explain how to set up the John Deere AutoTrac RowSense™ and Vision features on a 4600 Display and how to troubleshoot them if necessary. The AutoTrac RowSense system is equipped with feelers mounted inside the front wheels of the sprayer. The system uses voltages produced by the feelers to determine how to steer the sprayers for the best results. The RowSense feelers don’t require the user to calibrate them because they calibrate themselves during operation. However, it’s important that the RowSense panels stay in contact only with the stalks of the corn as they’re operating. If this isn’t occurring, there are several options available to correct this problem as demonstrated in the video. RowSense has multiple options in terms of monitoring performance and steering. To understand how the sprayers are operating, the system color codes certain icons to let the user know if the sprayers are on standby, using GPS to detect lines, or if the system is using GPS and feelers to detect lines. If the system isn’t performing how it should be, the user can run through a series of tests to recalibrate AutoTrac or reset it to factory settings. AutroTrac Vision is easy for the user to set up. Simply go into the applications menu and select “Layout Manager” and then add the “Video” widget so AutoTrac Vision’s camera will run properly. The system needs to be calibrated under several circumstances such as when the user replaces the camera or when changing crop type. To begin the calibration, go into RowSense status and select “Begin Cal” and provide further details such as crop spacing. Then, begin moving the machine for calibration. When operating AutoTrac Vision, there are four icons that indicate how well the system is working. These include system confidence, slope feedback, row spacing and current offset selected, and status icon. The user can operate the system in manual or GPS mode. If a problem occurs, the user can check the advanced settings and reset to the factory default. Checking to make sure the camera lens is clean and the front and rear tires are the proper widths apart is also important before recalibration. Farming equipment has come a long way in assisting farmers with producing their crops. John Deere AutoTrac is a tool every farmer should have in his or her toolbox. The user-friendly interface makes it simple to work with and get great results. RowSense and Vision provide additional knowledge to the user so they can better understand what’s happening outside of their tractor. AutoTrac is the extra set of eyes farmers wish they had. For more information about John Deere AutoTrac, contact your local John Deere dealer.